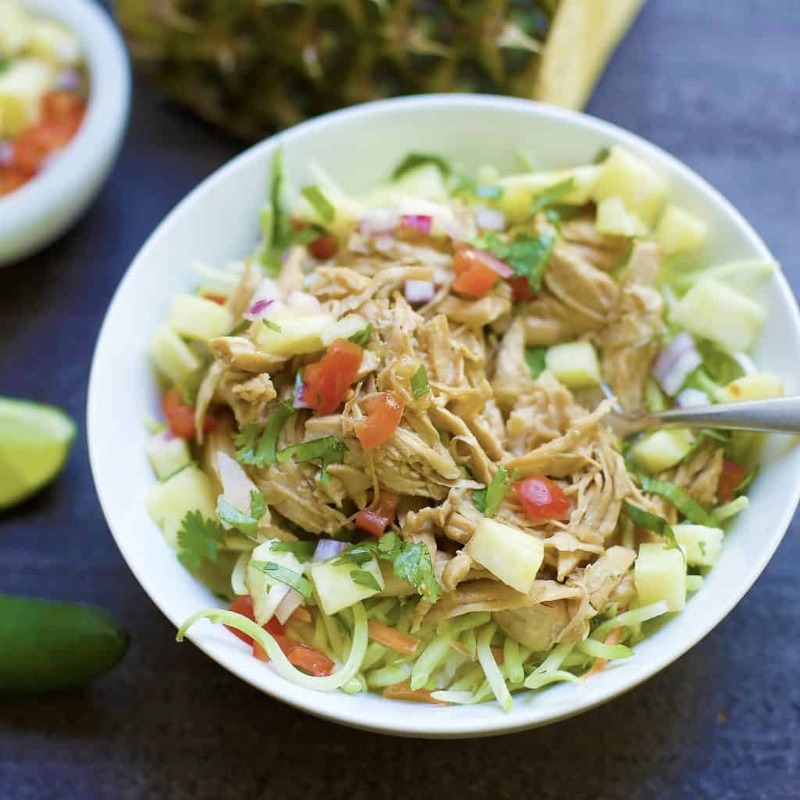 Slow Cooker Hawaiian Chicken Tacos are so simple to throw together, and delicious paired with a pineapple salsa. A great spring or summer dinner for a busy weeknight! It’s officially hot you guys. It’s that time of year where we don’t necessarily want to cook, we want light and easy. And we don’t have time to grill everyday. Sounds like your life right now? Mine too. 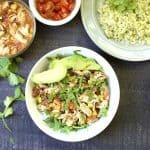 That’s why I made these Hawaiian Chicken Bowls. Or kind of tacos. I served over salad so it was kind of a taco salad. Or chicken salad. Anyhoo……The important details for you to know, is that this meal has few ingredients. Sooooooo easy to throw it in the crockpot. Put your kids in charge, they seriously can’t mess this up! 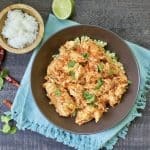 The combination of salty, sweet, and creamy coconut chicken will easily shred and tenderize while being slow cooked. 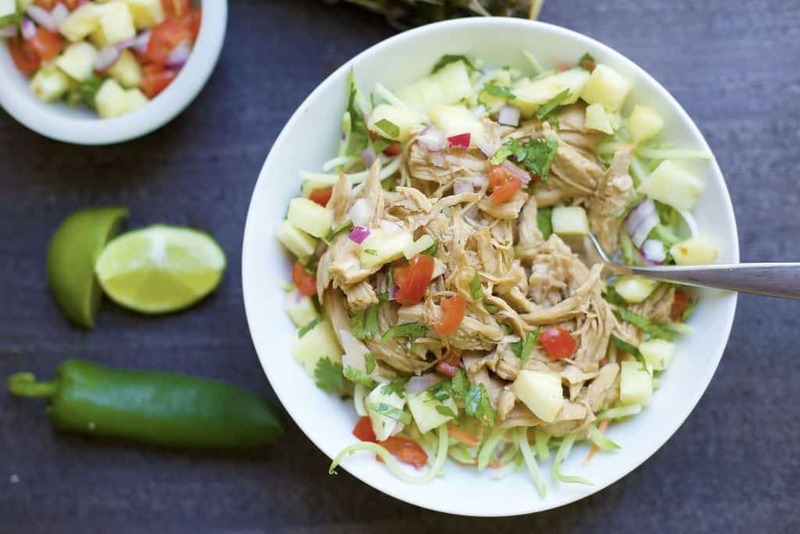 I love my slow cooker in the summer because I still cook dinner without heating up the house. Also important, is that the pineapple salsa is a must. It freshens up the meal for a delicious summer taste. The salsa comes together in about five minutes, and can also be stored in the fridge for a few days. 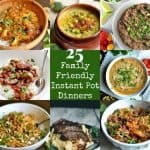 I served mine over a bed of greens and broccoli slaw, my husband wanted his over rice, and the kids loved theirs wrapped in a tortilla. So many good options!! A fun twist on Taco Tuesday! 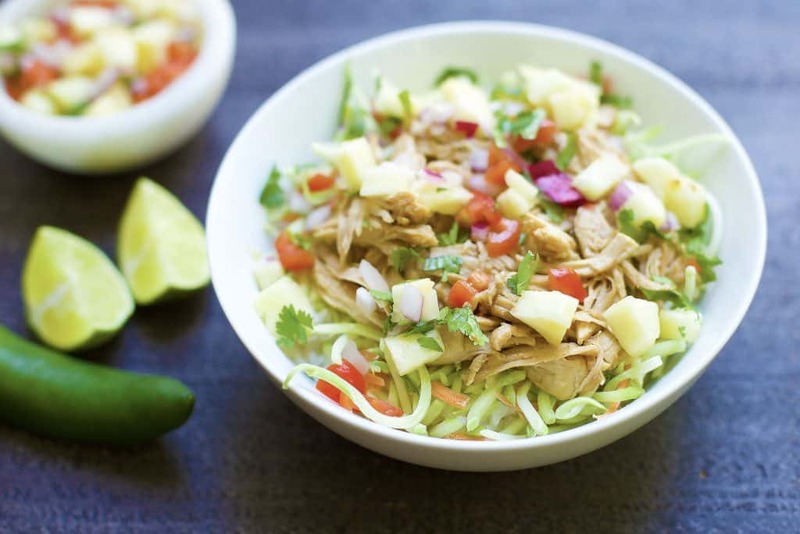 In a medium sized bowl, mix together coconut milk, coconut aminos or soy sauce, honey, and juice of 2 limes. 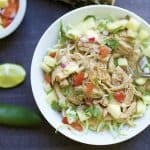 Place chicken inside your slow cooker, and pour coconut mixture on top. Cook on low for 4-6 hours, or until chicken can be easily shredded with a fork. Add arrowroot starch to thicken if needed. Meanwhile make your pineapple salsa. Be sure to cut pineapple, tomato, onion, and pepper into small pieces. Toss with cilantro and lime juice, sprinkle with salt and pepper to taste. Serve chicken with sauce over a bed of greens, rice, or tortillas. Top with pineapple salsa and extra sauce. 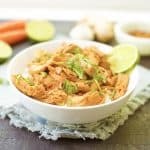 Place chicken inside your Instant Pot and pour coconut mixture on top. Secure the lid. Select the manual function. Cook on high pressure for 7 minutes. Use a natural release. Once all the steam has been released, open lid. Shred chicken with a fork. If you want to thicken the sauce, add arrowroot starch. This is a FANTASTIC recipe!! I made a few modifications for the salsa because I didn’t have the listed ingredients on hand. Instead, I used 1 c chopped pineapple, 1 c salsa, 1/3 c cilantro, s&o to taste. We served it over mini greens and cauliflower rice. We can’t wait to eat the leftovers tomorrow! Woohoo!!! Glad you loved it, Christy!